The time has come, I can no longer tolerate their mischievous presence on my kitchen window sill. If they have eyes on stalks that grow by the day who knows what else they might develop? I certainly cannot risk the possibility that they may someday be able to talk and expose my fifty shades of green lifestyle! So the potatoes are going under….well some of them anyway, the rest have been relegated to the windowsill at the back of the larder to chit behind a closed door. Grandpa Haxnicks advised that I shouldn’t sow them all at once unless I want to harvest them all at once and have a glut of potatoes, and then I would have to eat them all at once and have a gut full of potatoes and end up looking like a potato, not one of my ambitions, so I will sow one planter at a time. Job done. I chose the 4 seed potatoes with the most prying eyes, about 2.5cm long and buried (I think the kinder word is planted) them in a potato planter on top of 10cm and under 5cm of multi- purpose compost. When their prying shoots appear through the soil I will bury them further! I went to visit Grandpa Haxnicks this week hoping for a cup of tea and some gardening gossip (mostly vegetable based rivalry with his neighbour), only to be put to work preparing some of his raised vegetable beds for the growing season ahead. We removed all the weeds, dug it over and then put out some Easy Fleece tunnels to help warm the soil presumably so that he can get his growing season well under way before Mr Perfect Parsnips next door. This entry was posted in Potty Gardener and tagged Amateur Gardening, Chitting potatoes, Easy Fleece Tunnels, Haxnicks Potato Patio Planters, Potato Patio Planters on 2nd March, 2015 by Potty Gardener. There are some peculiar brown, wrinkly things lurking on my kitchen windowsill. They may be small and silent but rather alarmingly they seem to be growing poisonous eyes on stalks! Grandpa Haxnicks assures me that they can’t see me (I have my doubts), but I am relieved to know that in a few weeks I can safely bury them out of sight. If they continue to grow and possibly reproduce I am told that it is quite reasonable at some stage to dig them up, boil them alive and eat them (shhh maybe they have ears too). Anyway, as well as keeping a careful eye on those potato eyes I have gathered some pots, planters and grow bags ready to create my self-contained garden. Grandpa Haxnicks has kindly delivered some goodies and I have scrubbed up some old pots. I have also cleaned up and cleaned out the greenhouse and green it was, every pane coated in verdant mould, so I scrubbed the glass with a vinegar solution which apparently made me smell like an old gherkin. Lovely! The next stage in my plan is carrots, Amsterdam Forcing Carrots to be precise. I also wonder who names the carrots? They sound even more imposing than the potatoes, why not something gentler like Nether Wallop Nudging or Trumpton Tender? Any more suggestions…..? This entry was posted in Potty Gardener and tagged Amateur Gardening, Chitting potatoes, Haxnicks Potato Patio Planters, Chitting, The Potty Gardener on 4th February, 2015 by Potty Gardener. Spring is in the air, throw open the windows! We should be out in the garden getting some fresh air and exercise. There is plenty to do from clearing winter debris - twigs on the ground and hedge cutting - as it is time to smarten up your gardens and get ready for planting very soon. Sow seeds inside: such as aubergines, brussels sprouts, celery, cucumber, fennel, kale, lettuces, melons, nasturtiums, marigolds, peas, rocket and tomatoes – if you haven’t already. 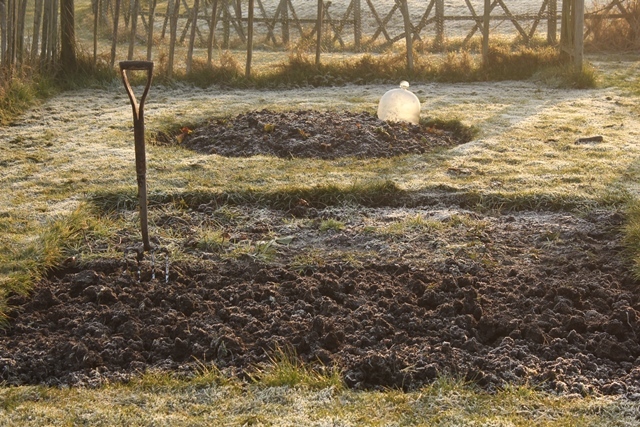 You can begin to sow seeds outside too but to be on the safe side I would cover them with cloches to give them a better chance. You can sow, onion sets, parsnips, potatoes (if they are chitted), spinach, rhubarb(crowns) and strawberry plants. Chit your seed potatoes: this means place each seed potato separately onto a tray or in egg boxes and leave them somewhere cool and light. They must be kept away from any chance of a frost. You will notice that in a couple of weeks they will start to sprout shoots, when this happens you can plant them out into the ground. Get your beds ready: Remember in order not to ‘do your back in’ only do the tiring jobs for twenty minutes at a time, such as digging. I have dug mine and added loads of manure and compost to raise the height of the bed, as last year it was so water logged and everything drowned. I am determined to give everything a better chance this year. Positive thinking. So digging an adding compost/manure are things that need to be done over the next couple of weeks. This entry was posted in Madeleine and tagged Chitting potatoes, Cloches on 13th March, 2013 by Haxnicks.